Dream B.I.G. in 3D | Passion in Action! Put Your Passion in Action & Live Your B.I.G. Dreams! We all have dreams. I’m not talking about the dreams that you have at night. I’m talking about the thoughts and desires that are so much a part of you, seemingly you can’t get away from them. It’s that hunger and drive inside of you to be something more than what you are right now; to do something far beyond what you have accomplished at this point in your life. It’s the thing that you love to talk about more than anything else. Even if you don’t talk about it much, it’s still got a hold of you more than you have a hold of it. Have you ever wondered what your true life’s work really looked like? Not the part that resembles the mundane tired existence you so hesitantly pursue everyday but the bold, innovative, passionate you bursting with brilliant ideas, poignant solutions and inspiration. The only thing that stands in your way is the gap between your frustrated reality and the true vision you see when you dream. The path to thriving starts with dreaming. For those interested in experiencing “Dream B.I.G. in 3D Live!”, I offer high-energy, thought provoking, life changing workshops and speaking engagements. These programs and events are geared to those who want to take their lives to another level. 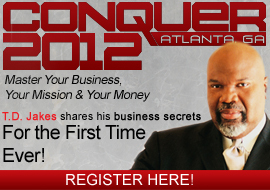 I am very excited about these opportunities to help you effectively get your dream out of your head and into your life. I look forward to hearing how Dream B.I.G. in 3D has helped you fulfill your dreams! Purchase your copy of Dream B.I.G. in 3D today!